Well, another Thursday ride. Nothing too special about that. I started from West Seattle, where I have been doing some work. Then to Westlake Center to meet up with the rest of the crew. The night wasn't bad. Clear and cold, with some wind coming out of the North. At 7:30 about 30 riders took off, heading South. We rode all the way down Rainier into Renton. Then headed off to a secret wood. Some of the folks had picked up some fire wood, so we had some heat and light to stand around. Actually too much heat. I kept backing away from the fire because it was frying the part of my legs not covered by my shorts. I never thought that I would desire pants because shorts were making me too hot. There was one other problem with my attire. 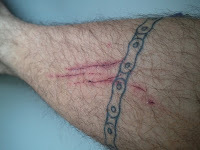 Because of the heat of the fire, I backed my unprotected leg into some nasty foliage. That blackberry got me pretty good. After the fire started to die down. We headed out, up to Georgetown. Found a nice place indoors. No fire, but they did have a nice place to sit. After a few libations, the party broke up, and I was in for the long ride home. Seattle to Issaquah after dark is a hell of a ride. I thought this would be the first week in more that a month I hadn't done 100 miles or more. I guess I was wrong.